The bowtie method of risk assessment creates diagrams that visualise the risk you are dealing with in a single clear picture. The diagram is shaped like a bow tie, with the 'knot' showing the point where control over a hazard is lost. To the left of the 'knot' the threats and the measures to control them are shown. 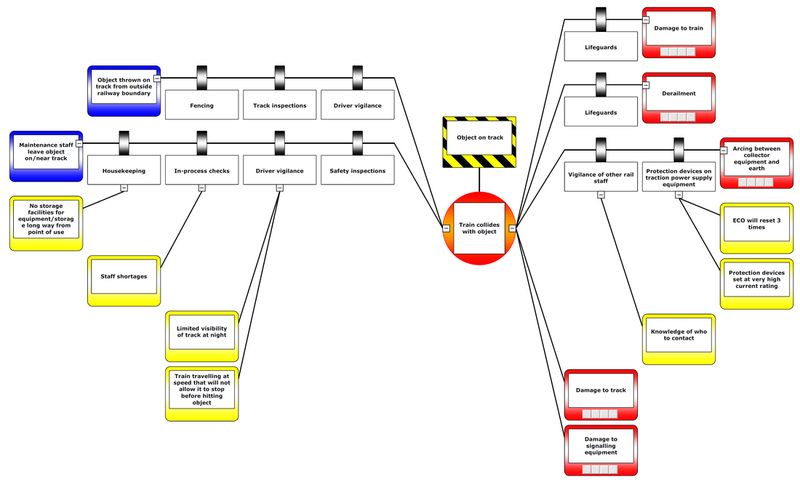 To the right are the possible consequences of the hazard scenario, along with the possible control measures to limit or nullify them. The bowtie therefore creates a picture of risk that is easy to understand and for groups to contribute to. Bow tie models can be overlaid with audit and incident information to show how well each risk control is working. We are a Value Added Partner for CGE Risk Management Solutions and can provide trial and full versions of their industry-leading software packages for producing bowtie models. We can provide consultancy services to produce bowtie risk models for your business if you do not want to develop the expertise in-house. This is a one day workshop. The programme can be extended to allow delegates to complete a range of bowtie risk models on for their own organisation using trial versions of the BowtieXP software and the AuditXP software. The workshop is ideal for directors, managers and safety professionals who are looking for an improved way to manage risk in their business and involve their workforce in the process. develop skills in using BowTieXP software. BowTieXP is the most used risk assessment software that is based on the bowtie method. It is produced by CGE Risk Management Solutions BV and enables you to easily create bowtie diagrams to assess risk. BowTieXP is unique in its ability to visualize complex risks in a way that is understandable, yet also allows for detailed risk-based improvement plans. AuditXP is an audit and compliance software tool, employing the same software framework as BowTieXP. The tool is developed to close the “Plan-Do-Check” circle (Deming circle). After defining the barriers in your safety management system (the plan stage) and implementing them (the do stage), AuditXP is used to check and monitor the quality and effectiveness of the barriers. Silver Moor Business Consulting has been appointed as a value-added and expert agent globally for CGE Risk Management Solutions BV to provide BowTieXP, AuditXP, training and consultancy for the bowtie methodology. Logos and trademarks are the property of CGE and used by permission. We can customise any of our training courses to address the specific issues faced by your industry or business. We will run the training at your workplace so you save on travel and accommodation costs. The bowtie method is an excellent approach! Good course to learn a different way of doing risk assessments [bowtie risk models]. We need this so that we can contact you with the information you've asked for. We won't use this information to send you marketing emails, nor will we pass it on to anyone else. We need this so that we can contact you with the information you've asked for. We won't use this information to send you marketing texts, nor will we pass it on to anyone else.